House finches possibly infected by Mycoplasma gallisepticum (mycoplasmosis). Eyes closed with swelling of the eyelids, ocular discharges and loss of feathers around the eyes. (photo credit: Camille Bélanger). We have started to receive reports, in Montreal area, of house finches and American goldfinches with clinical signs highly characteristic of Mycoplasma gallisepticum infections. If this disease is confirmed, this winter will be the second consecutive winter during which outbreaks of this potentially fatal infectious disease are documented. 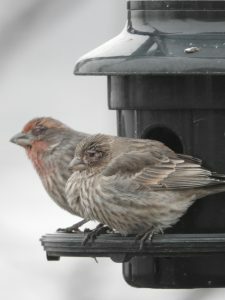 Mycoplasmosis, also known as house finch eye disease, is an infectious bacterial disease that affects the eyes and upper respiratory tract of birds. The house finch (Carpodacus mexicanus) is by far the most commonly affected species. This infection has also been documented in other passerines, such as the American goldfinch (Carduelis tristis), the purple finch (Carpodacus purpureus), the evening grosbeak (Coccothraustes vespertinus), and the pine grosbeak (Pinicola enucleator). This disease mainly affects birds on the eastern part of the North America. It is usually observed in proximity of bird feeders. The first episode of avian mycoplasmosis in house finches was described in the winter of 1994. The frequency of this disease appears to have decreased considerably in recent years, suggesting a certain equilibrium between this pathogen and susceptible birds. The occurrence of clusters of new cases again this winter suggests a rupture of this equilibrium. In passerine birds, mycoplasmosis mainly affects the eyes. The disease is characterized by a swelling of the eyelids and redness of the conjunctiva often associated with secretions and crusting. Sneezing and breathing difficulties can also be observed. In extreme cases, the crusts and swelling may cause complete closure of the eyes. These birds have difficulty feeding due to visual impairment; they are often found on the ground, looking for seeds near bird feeders. Consequently, even of this conjunctivitis is not directly fatal, the blindness can be responsible for starvation that can lead to death. In addition, birds become an easy prey for predators. During a known outbreak of mycoplasmosis, temporarily remove bird feeders and bird baths (for one to two weeks) to reduce bird aggregation. Clean your feeders and bird baths regularly with a solution of 5% bleach (one volume of bleach for 19 volumes of water). Allow feeders and baths to dry before putting them back in place. It is usually not recommended to treat infected wild birds, as the use of antibiotics could lead to the development of a carrier state which could lead to an overall increase in the spread of the disease. Brushes and equipment used to clean bird feeders and baths must not be used for other purposes. Keep them outside and away from food preparation areas. Wear rubber gloves when cleaning bird feeders and wash your hands and forearms thoroughly with soap and water, especially before eating and drinking. Avoid handling sick or dead birds directly with bare hands. Previous story Mycoplasmose chez des passereaux sauvages : Émergence de cette maladie au Québec pour un deuxième hiver consécutif?